Ticks, Ticks and more Ticks !!! Home » Ticks, Ticks and more Ticks !!! Are you finding tick numbers on the rise? If you are, it’s not just your imagination. Over the last few years the Canadian tick population has been growing, resulting in people having to remove ticks from themselves and their pets more and more often. Although the data does not make any suggestions as to why they are multiplying, we can only hope that this may be a natural cycle similar to what is seen in some other insect populations, and with some luck the populations may diminish again in the next 5-10 years. Until then, here is some information you may find helpful when trying to combat ticks on your pets. Ticks in General Ticks are most often found in areas of overgrown grass and weeds, and low brush. Most tick species employ an “ambush” technique whereby they climb to the tip of the grass/brush waiting for a potential new “host” to walk by, as soon as contact is made, the tick releases the vegetation and jumps aboard! Some tick species mate before the ambush and then the female jumps onboard looking for a blood meal before laying her eggs. But most species jump aboard looking for a date. They will roam around their new host (person, pet or wild animal) for a day or 2 looking to mate with another tick. After mating they search around for the best spot for a bite to eat and attach themselves for a blood meal. The male tick will eat sparingly, and will not engorge (or swell), but the female settles in for a big meal – after all, she has babies to feed! Some females will swell to 100x their pre-meal size before detaching and dropping off her host up to 10 days later. She will then digest her meal, grow her eggs and look around for a place to lay her eggs – 1000’s of them! Depending on the tick species a female may lay up to 6500 eggs at one time! It can take up to 2 years for those eggs to become adult ticks, but when they do there is an army of them. Where to look for ticks? On pets ticks favour the ears (both sides of the ear flap or in the opening to the ear canal), the face, lips, armpits and toes. That said – you can find a tick anywhere of the body so look closely. On people ticks often favour areas with hair, or where there are gaps in clothing. If you are hiking in tick country; wear long sleeves and pants, tuck in your shirt and tuck pant legs into socks. How tough is a tick? When a tick bites their saliva contains a chemical similar to a local anaesthetic. That’s why they can bury their head into the skin and you can’t feel that it’s there. But this feature is helpful when you are removing the tick as you can dig into the skin a bit to ensure you get the tick out AND her head, without your pet feeling too much discomfort. Don’t like to dig? – ask your vet if they have a “Tick Twister”, a handy little tool that looks like a miniature plastic crow bar, you slide it under the tick body and gently rotate popping the tick off. If you have ever tried to kill a tick and wondered why they are so hard to squish, you won’t be surprised to find that a distant evolutionary relative of the tick is the Horseshoe Crab! Hope to wait one out? Think again, a tick can live up to 2 years without taking a single blood meal. Dermacentor variablis: (The American Dog Tick) This is the most common tick you will encounter. Lighter brown in colour, it has a “double horseshoe” design behind its head when not engorged. It can be found from early spring to late fall but its peak season is May – July. Ixodes scapularis: (Deer Tick or Black-Legged Tick) This tick is smaller and less common. It is darker brown and can often be identified by a black spot on its back when not engorged. This tick’s peak season is late summer and fall. The young male Ixodes may only be about 2mm in length – he’s small, so look closely! ***This is the tick that can transmit Lyme Disease (see later for more information). .What is the deal with Lyme Disease? Lyme Disease is caused by a bacteria called Borrelia burgdorferi. This bacteria can only be found in some Deer Ticks/Black-legged ticks (Ixodes scapularis). It is transmitted from tick to person/animal while the tick is attached and taking a blood meal. For individuals that contract Lyme Disease the illness initially causes flu-like symptoms (fever, tiredness, loss of appetite), a rash and/or lameness. These symptoms may be mild or severe, they may resolve on their own or require treatment. Some individuals may seemly recover but then 2-5 months later developed other symptoms such as arthritis, chronic heart or nervous system problems or chronic skin changes. The Public Health Agency of Canada (PHAC) carried out a tick study in the Niagara region in 2007. They collected and tested 745 Ixodes ticks from our back yards – only 6% of them were found to be carrying the bacteria capable of causing Lyme Disease. ***But they did find a higher concentration in ticks found in or near the Wainfleet Bog. If you or your pet is unlucky enough to be ambushed by one of these 6% of Ixodes ticks with B.burgdorferi, the tick generally needs to be attached for 24-48 hours before the bacteria has a chance to move into the host (you or your pet). So finding and removing ticks daily goes a long way to preventing the transmission of Lyme Disease. So let’s say one slipped through your thorough check over? You and your pet also have an immune system for defense. Most healthy immune systems will manufacture antibodies against the B. burgdorferi bacteria when it enters the body and fight it off. This antibody response will result in your pet showing a “Positive” results on a routine Lyme Disease blood test. That means your pet has been exposed to the Lyme Disease bacteria, but not necessarily infected by it. In 2007 Idexx Laboratories partnered with PHAC to study Lyme Disease in Ontario. They analyzed the results of 94, 928 blood samples from routine Lyme (4Dx) blood tests collected from dogs across Ontario. Only 0.58% of those samples were Positive (showing a past exposure to the Lyme Disease bacteria had occurred). Of that 0.58% of dogs a healthy immune system prevented Lyme Disease from developing in 95%. That means only 5% (or 27 individuals) of the 550 individuals that were exposed actually became ill. Feeling better yet? Here’s more good news… Idexx and the PHAC consider the above numbers to be an exaggeration of the true risk once you factor in the number of potential falsely positive tests, and once you remove all the dogs that were exposed to the Lyme Disease bacteria when they travelled outside Ontario, not from ticks inside Ontario. If you are still concerned about your dog’s risk for Lyme Disease – ask your veterinarian about the vaccination available for dogs to protect against Lyme Disease (not to prevent ticks!). 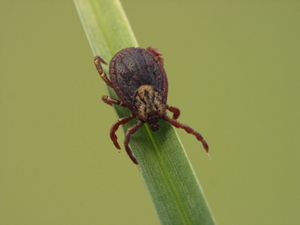 Where to avoid There are pockets of tick populations in Ontario that the Lyme Disease bacteria is found to be more prevalent in the Ixodes tick population (although still fairly low) – these are called “endemic areas”. These areas include: Point Pelee, Rondeau, Long Point, Turkey Point, Prince Edward County, and the 1000 Islands. We could see the Wainfleet Bog added to this list in the future. .Advantix (from Bayer) – not to be confused with Advantage or Advantage Multi (also from Bayer). This product helps protect your dog from fleas and ticks (but NOT Heartworm). It is applied to the skin on the back in a spot-on formulation, once a month. It is effective against all 3 common species of ticks in our area, although it is only about 85% effective against the Ixodes scapularis species. This product will kill ticks within 24 hours but if the tick is attached it may remain attached (but dead) until its mouth parts disintegrate and they fall off. **This product can be toxic when applied to cats, or if cats groom, or sleep with, treated dogs. Revolution (from Pfizer) – Applied in a similar fashion to Advantix, once monthly. This product helps protect your pet from fleas, ticks, Sarcoptes mites (mange) and Heartworm disease. This is the only product that is also safe to use on cats for tick prevention. The down side of Revolution is the product can take up to 3 days to kill the tick depending on how fast the tick is feeding, and Revolution is only effective against the Dermacentor variablis (American Dog Tick) and the Rhipicephalus (brown Dog Tick) species. Good luck with your Ticks and have a safe summer! (1) Canadian Guidelines for the Treatment of Parasites in Dogs and Cats .Canadian Parasitology Expert Panel for Companion Animals.Published March 2009. (2) ACVIM Small Animal Consensus Statement on Lyme Disease inDogs: Diagnosis, Treatment, and PreventionMeryl P. Littman, Richard E. Goldstein, Mary A. Labato, Michael R. Lappin, and George E. Moore. Journal of Vet Internal Medicine 2006;20:422-434. (4) Seroprevalence of Borrelia burgdorferi, Anaplasma phagocytophilum, Erliclia canis, and Dirofilaria immitis among Dogs in Canada. Alain Villeneuve, Jonas Goring, Lynne Marcotte, Sebastien Overelde. Canadian Veterinary Journal 2011;52:527-530. ***A special thanks to the Bayer and Pfizer Companies for assistance in accessing some if the above references.